We blog about cruising, especially while we are on a cruise. All kinds of interesting insights into the world of cruise with specific destination and cruise line informaton anyone who cruises will want to read about. 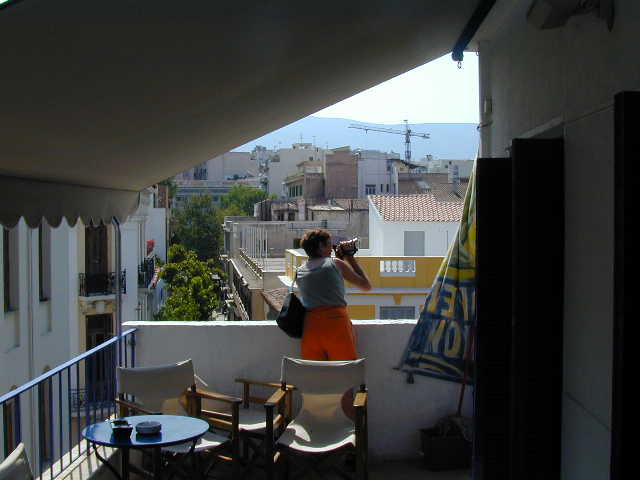 The ship actually docks in Piraeus, and you take a bus or cab to Athens itself, about a half hour trip as I recall. The ship of course has busses lined up for those who want to go to Athens for the day, but Kathy and I decided to just grab a cab. Our visit to Athens was sandwiched between two “at sea” days. That’s the way I like it, rested up and ready for a new port of call. Then come back tired and have a sea day to rest up. 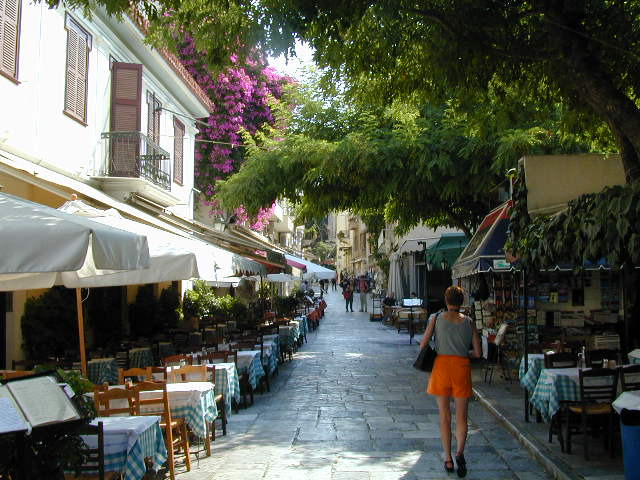 In truth, Athens wasn’t all that exhausting. We had been to Athens on our last cruise less than a year previous, and so we just strolled around and did some window shopping in Athens. We did go to a tiny little internet café to update our website. It was on the third floor of a very old rickety looking building. The only way to and from the café was a very narrow spiral stairway. It was a little scary. What if there was a fire or an earthquake or something? We had lunch in an outdoor restaurant and of course I had to get photos of the food. Lunch was excellent. After lunch we wandered down some little side streets to kind of see how the local people lived. It was interesting. Everything is so old. Here is a batch of photos from our day in Athens from our cruise on the Millennium. And this is the view out the window in front of Kathy in the previous picture. You can just see the corner of the Parthenon atop the acropolis. Awe inspiring views wherever you look. Still in the internet cafe... different side of the building. 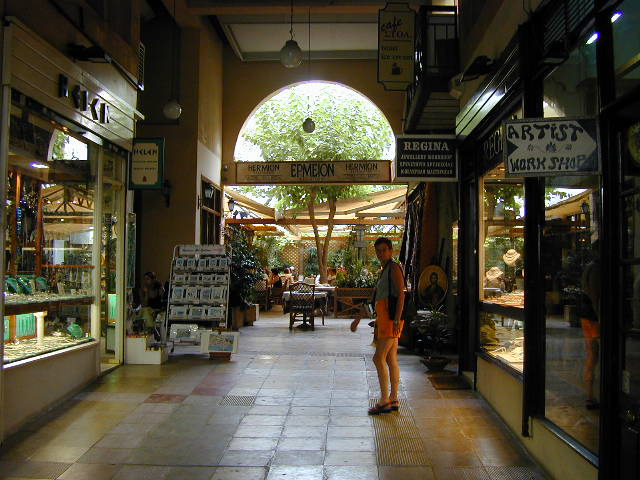 Kathy, in a nice little indoor mall.. directly ahead is the reataurant where we had our lunch on our day in Athens. I had stuffed zuchinni... it was very good... much better than it looks.